Enterprises continue to migrate applications to the cloud. In fact, it is estimated that 90% of enterprises will use multi-cloud, i.e. multiple public and private cloud services and platforms, by 20201, to support their ever-expanding application requirements. In today’s cloud-first world where SaaS and IaaS become extensions of the enterprise network, it is critical for the business to reach these cloud services by the most efficient and highest performing means. Frequently, cloud applications perform better from home than from the branch. The router-centric model employed at branch offices backhauls web-bound traffic to headquarters-based security infrastructure such as next generation firewalls and IDS/IPS solutions to protect the branch from vulnerabilities; backhauling traffic adds latency which negatively impacts application performance. An unmanaged broadband internet connection delivers higher bandwidth and direct access for all cloud applications (direct to net). However, applications require different quality of experience and security considerations. Service providers are challenged to offer services that control the traffic to applications hosted in the cloud with a managed secure local internet breakout solution. Not all local internet breakout solutions include the ability to enforce application-specific security policies in realtime, and not all solutions provide daily SaaS/IaaS IP address updates to keep pace with the dynamically changing nature of cloud applications. With the right solution, service providers can offer the best SaaS and IaaS performance while optimizing underlying network resources, and ultimately, guarantee a superior user experience at lower cost. Securing “untrusted” broadband – Local internet breakout exposes branch users and their local networks directly to the “untrusted“ broadband internet and potentially to its myriad threats. Service providers that support broadband internet services as an SD-WAN connectivity option must support granular service policies that can restrict application traffic to certain outbound destinations and enforce granular security policies. Application traffic steering based on security policiess – Not all web traffic is equal, and security policies must enforce different security policies. For example, a security policy might specify sending trusted traffic directly to the internet while redirecting untrusted traffic to a security web gateway or next generation firewall. To implement such policies, web traffic must be granularly steered to its correct destination based on the application. This requires identifying the application on the first packet; once a destination has been selected for a given flow, it cannot be changed without restarting the session. Existing application classification techniques using a combination of well-known IP addresses, port numbers and Deep Packet Inspection (DPI) are unable to consistently enable granular traffic steering to a specific destination based on the application. A security policy might work when initially configured but might fail when the SaaS application IP addresses change. A managed SD-WAN service offering must be able to dynamically secure applications based on defined policies whether the applications are hosted in public or private clouds. Lack of integrated security and application policy administration – Traditional security architectures in branch offices are not centrally managed and configured. Security policies – and any subsequent changes to them – in this model must be configured manually, resulting in management complexity. Service providers offering a managed network security service, are required to provision, monitor and update security policies on individual security appliances for any new application. This manual configuration process is lengthy, cumbersome, costly and prone to human error. Different applications often require different treatment when it comes to how they are handled from a security perspective. For example, a major financial application processing a sensitive transaction might require encryption regardless of the type of transport being used to meet compliance requirements, while SaaS applications could be left to rely on their own native capabilities (e.g., TLS). This is why it’s important to base managed SD-WAN services on an application-driven SD-WAN solution, where policies and configuration settings can be implemented on a per-application basis. An integrated zone-based stateful firewall is essential for a complete, secure local internet breakout solution enabling direct internet connectivity to trusted SaaS applications and IaaS from branch offices. The EdgeConnectSP zone-based firewall further hardens the enterprise WAN by blocking unwanted or unauthorized traffic attempting to enter the branch network from the enterprise LAN. EdgeConnectSP supports simplified service chaining, using a drag-and-drop interface, to enable service providers to automate and accelerate the integration of security partners’ advanced services (e.g. Check Point, Fortinet, Palo Alto Networks, Symantec), secure web gateways (e.g., Zscaler, McAfee, Forcepoint and OPAQ Networks), and secure DNS (e.g., Infoblox) utilizing private secure encrypted IPSec tunnels. Figure 1: Granular traffic steering requires application identification and classification on the first packet. As described previously, not all web applications are created equal and they require different application-specific security policy enforcement in accordance to security policies. To enforce those policies, traffic must be classified and steered appropriately on the first packet. Silver Peak first-packet classification technology (First-packet iQ™) enables EdgeConnectSP to intelligently traffic steer on the first packet to the correct SD-WAN overlay based on predefined application-driven business and security policies and across the underlying WAN circuits utilized by that overlay. The overlays may be configured with a built-in zone-based stateful firewall that is included in the EdgeConnectSP SD-WAN solution plus the option to service chain with third-party security appliances for additional traffic inspection. 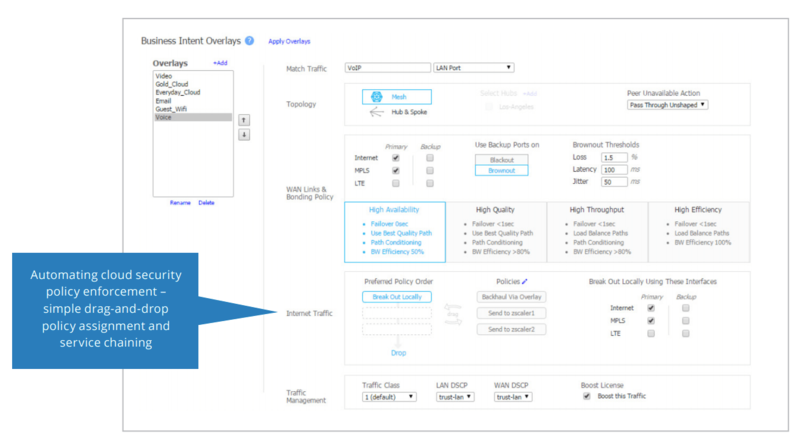 Application-specific overlays (Figure 2) may also be defined to enable micro-segmentation across the SD-WAN to help organizations meet compliance mandates. First-packet iQ uses Cloud Intelligence to maintain an up-to-date data¬base of IP addresses used by SaaS applications. In addition, automated daily updates of the application IP address database to EdgeConnectSP appliances keep pace with dynamic SaaS and web address changes. The solution eliminates the potential for wasted bandwidth and performance bottlenecks for trusted SaaS and web traffic. Trusted traffic gets treated appropriately while questionable traffic is automatically sent to more robust security appliances in accordance with corporate security policies. For branch sites not served by internet connections or if corporate security policies require backhaul of SaaS applications for additional security screening, Silver Peak Cloud Intelligence includes information to help the service provider optimally route traffic for the best performance. A key benefit of a comprehensive SD-WAN solution is simplified, centralized orchestration. Unity OrchestratorSP (Figure 3) empowers service providers to centrally define and orchestrate granular security policies and create secure end-to-end zones across any combination of users, application groups and virtual overlays, automatically pushing configurations to sites in accordance with business intent. This accelerates application deployment and provisioning while reducing errors, ultimately enforcing granular security across the LAN and WAN and increasing operational efficiency. Additionally, EdgeConnectSP appliances and Orchestrator can be fully managed and integrated with service provider OSS/BSS and/or northbound orchestration systems with REST APIs. Any feature or capability that is available on the Orchestrator GUI is available via REST APIs. Figure 3: Silver Peak Unity OrchestratorSP – simplified drag-and-drop policy assignment and service chaining.